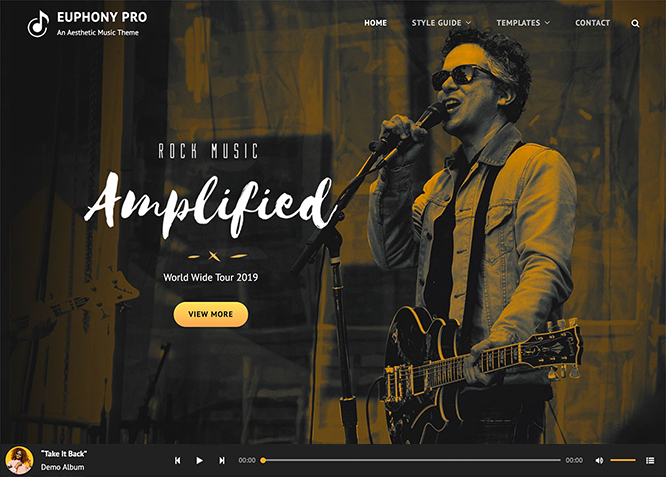 Euphony Pro is a premium music WordPress theme crafted beautifully for musicians and bands. It comes with a minimalistic, interactive and super elegant concept. Euphony Pro has been made to be versatile within the music industry and fun to play with. 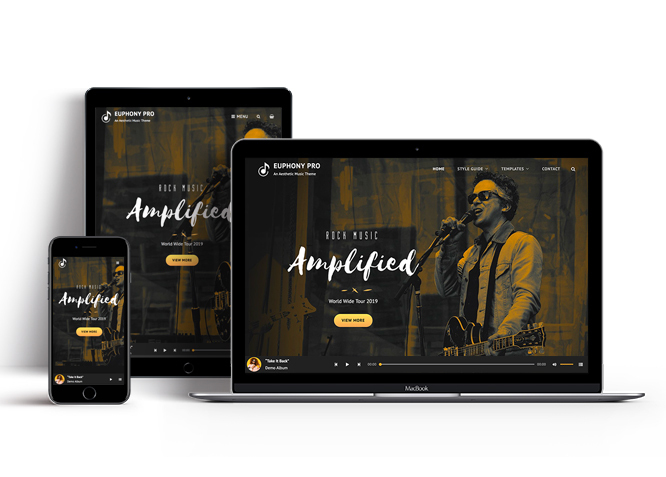 This theme is power packed with features like App Section, Contact, Events, Featured Video, Gallery, Hero Content, Logo Slider, Playlist, Portfolio, Sections Sorter, Services, Stats, Sticky Playlist, Team, Testimonials, and more. All of these features in Euphony Pro allows you to tweak your music website the way you like. Euphony Pro comes with numerous predefined demo. You can use those demos for different musical genres, as well as a number of varying projects that differ from magazine and music label to producer and blog. The theme is completely responsive and thus compatible with all kinds of modern browsers. 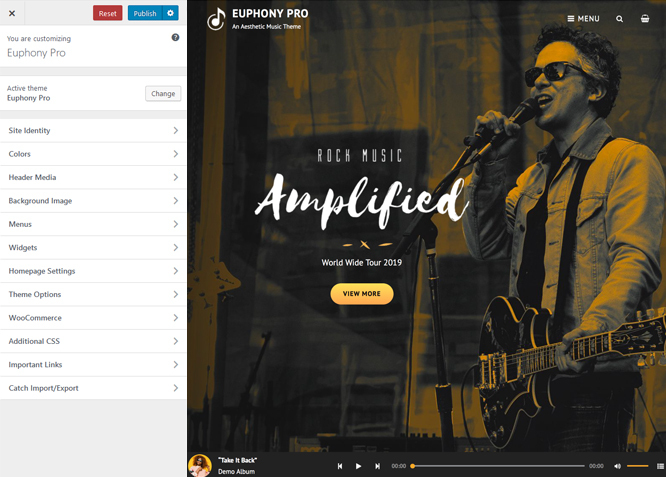 Let that musical vibe flow from your website with Euphony Pro! For more information, check out Theme Instructions. Featured Slider is an option that is helpful to highlight noteworthy posts on your site. You can have columns of content as well as selected images set on your post slider. The fun part is, you get to decide for how long a post stays on your page before something else comes up on the slider. How will you make that happen? By exercising your control over different slide effects and their timing! Webmaster Tools option helps you to minutely manage your site. Firstly, it helps to verify the site in Google, Yahoo and Bing. Additionally, whether it is something like site optimization, keeping track of your site traffic or overseeing and altering your display settings, you can call the shots for you site through Webmaster tools. These tools also allow you to add to your site Header and Footer Scripts like Google Analytics, Site Stats, Facebook, twitter and much more. Our themes have widgetized areas commonly known as sidebar. Here, you can add up various widgets and customize their display to satisfy your unique needs. Featured Image Slider allows you to not only add images, but also write a description for them. If a descriptive caption would not suffice, you also have the option of providing a clickable link. This way, as per your unique needs, should you require, you can easily add a URL to your content. Featured Content allows you to highlight your recent & popular posts on your website. It can either be displayed on Homepage or the entire site. You can add your title and sub-title for featured content, select the number of featured content, display Meta, select multiple categories, and enjoy displaying your featured & recent posts. Every website owner wants the world to know about the services they provide. It allows you to place the services you provide for your customers on the spotlight. Choose to display the services in 2 to 4 columns. Display your services on the homepage only or on the entire website. You can choose different types of stylish and engaging fonts for your Site Title, Tagline, Headline Tags, Content Title, and Content Body. Choose the font that suits best for your website from the font family options and makes your website more striking. You can now display the best assets of your website with the Hero Content feature. The feature allows you to highlight the most important content in a fashion that is easily attention-grabbing. You can enable the hero content either on Homepage or the entire site. Hero Content - the easiest way to display your strengths. Our code is secure and optimized. We do proper data validation and sanitization and follow core theme guidelines. Our developers are active contributors to WordPress theme review and WordPress core. Our themes will always be updated as things change in WordPress. People are always curious about what your goods and services are really like. Since customer testimonials are candid and not by the company promoting the product, they assist in building trust. You can display testimonials on Homepage, the entire site or disable it completely. Portfolio empowers you to showcase your professional skills and accomplishments to the world at large. Display your Portfolio in an elegant manner on the Homepage/Frontpage, the entire site or you can also disable it completely if you don’t need it. An astounding way to easily display your experience, skills, talent, and expertise. Sections Sorter allows you to organize various sections on your website by manually sorting them. Simply drag and drop the sections to your desired position and display them orderly.The cool feature in this option is that you can not only rearrange the order but also can quickly edit those sections from Sections Sorter option if you want any changes. #How to update theme to the latest version? This theme relies heavily on Featured Images. If your post is missing a Featured Image, the post image will not show up on homepage, on archived pages and on Featured Page Slider Content. Click Here to see how to add Featured Image in your Post/Page. You can customize this theme using cool additional features through Customizer at "Appearance => Customize" from your WordPress Dashboard. #How to add Site Icon (Favicon/Web Clip Icon)? #How to add Header Video? #How to add Header Image? #How to add App Section in theme? Euphony Pro supports Page, Post, Category and Custom as App Section. Go to "Appearance => Customize => Theme Options => App Section"
#How to Change the Excerpt Length and Read More Text? Finally, click on "Save & Publish"
#How to select different font for different sections? #How to edit Footer Content? Go to this link Note: To reset Footer Content check option "Check to reset Footer Content"
#How to add Gallery in theme? #How to Set Certain Categories to Display in Homepage/Frontpage? #How to add logo slider? #How to choose different menu style? #How to change Pagination Options? Go to "Customize=> Theme Options =>Playlist"
#How to add Promotion Headline? #How to enable/disable Scrollup feature? #How to change default text in search box? The Sections Sorter is a feature that allows you to organize various sections on your website by manually sorting them. You can now rearrange and put forward the section that you want your visitors to see first. You can sort the sections of your theme by visiting Customize => Theme Options => Sections Sorter. Simply drag and drop the sections to your desired position and display them orderly. Also, another cool feature in this option is that you can not only rearrange the order but also can quickly edit those sections from Sections Sorter option if you want any changes. #How to add stats in theme? #How to add sticky in theme? Go to "Customize=> Theme Options =>Sticky Playlist"
#How to add Team in theme? #How to enable/disable update notifications? #How to use Featured Content using Custom Post Type? #How to add Testimonials in Homepage/Frontpage using Essential Content Type? #How to add Portfolio in Homepage/Frontpage using Essential Content Type? #How to add Services using custom post types? Euphony Pro currently has 15 widgetized (Sidebar) areas thay are: 1. Sidebar, 2. Footer One, 3. Footer Two, 4. Footer Three, 5. Footer Four, 6. WooCommerce Sidebar, 7. 404 Page Not Found Content, 8. Optional Homepage Sidebar, 9. Optional Archive Sidebar, 10. Optional Page Sidebar, 11. Optional Post Sidebar, 12. Optional Sidebar One, 13. Optional Sidebar Two, 14. Optional Sidebar Three and 15.Newsletter. Go to "Appearance => Widgets" or "Appearance => Customize => Widgets" in WordPress. Euphony Pro supports CT: Social Icons. You can add widget in widget area as per your need. #How to add Widgets in widget area? You can add widgets to your widget area from two location Go to this link for more detail. #How to add "Social Icon" in widget area(CT:Social Icon)? Add "Title" under the respective field.